What’s New in the World of Pricey Waistline Quick Fixes? Just amazing – watching GMA today, May 8, when Juju Change reported with great earnestness, about “news” of a medical $15,000 waist-belt for hunger-reduction and weight control. It’s called “Vbloc” therapy. It looks like one of those mountain climbing kind of woven belts worn outside, while a device is implanted via surgery under the skin. A huge, alien-looking round buckle apparently emits electrical charges to that device, which charges block the waistline Vagus nerve relating to hunger. Another “new” surgery on the market to solve the international obesity epidemic! Why am I NOT surprised? This belt is in the “early stages of testing.” My guess is the belt simply and primarily makes it impossible for the tummy to expand, just like our tried-tested-and-true handsome leather, custom Waist Training Belt — priced under $200 (base price). $15,000 versus $200 — less the electrical charge. And even if the electrical charge aids the reduction of hunger pangs, is it worth an extra $14,840? Apparently so, for some. 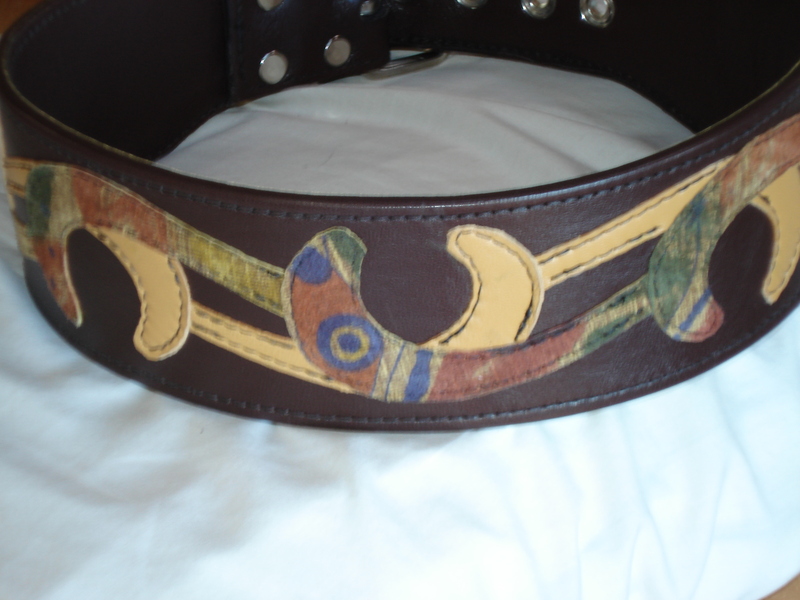 On my part I’d order a plain and a fancy ROMANTASY belt, and have money left to order another (gulp–tis true!) 3,000 custom corsets, depending on style, corsetiere and design! Our Belt, however, is NOT in the “early stages of testing.” We make it plain, seen above left, or fancy with embellishments, see above right. It has an underflap to prevent skin pinching. It has been on our market for over 15 years (and there are others for sale by other corset-related businesses), and has been ordered by hundreds of our clients, tried out, and found to be quite effective in cutting hunger and reducing the appetite almost immediately, thus resulting in permanent waistline reduction and weight loss in a few short months. In mid-2010 we sadly lost our beltmaker Kevin who passed, and we have a temporary inability to supply orders. We will let you know when we can provide these again because they make nice complements to put into your training inventory of garments. So continues our fascination with all things called “medical” and with quickf9x surgery, and more’s the pity when it comes to our pocketbooks. A little bit of elbow grease and effort with a non-medical device like our Belt, would seem a much better priority to set during these recessionary days, don’t you think?